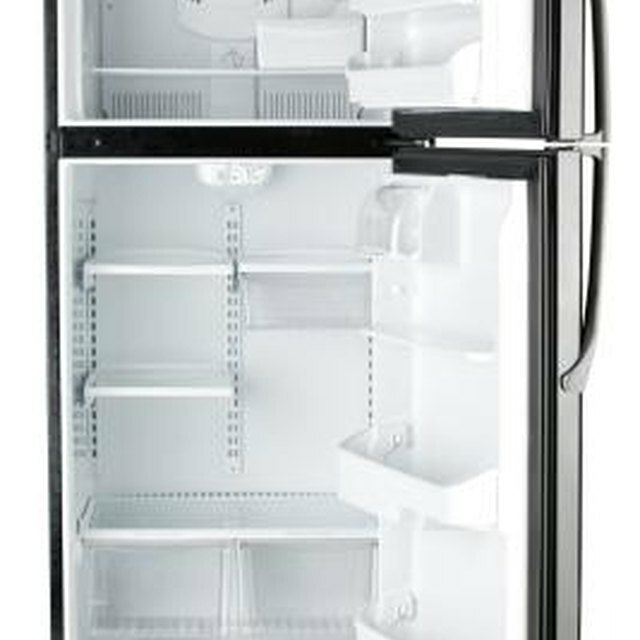 Frigidaire side-by-side refrigerators feature a refrigerated compartment and a freezer next to each other. A water and ice dispenser is set into the freezer door. If your Frigidaire is freezing up, it is likely a problem with either the evaporator unit or the self-defrost unit. Ice and frost in your freezer compartment is symptomatic of a problem. The evaporator unit is inside the inner panel of your freezer, and its primary function is to keep the freezer cold and the refrigerator cool. It is composed of coils -- similar to a radiator in design -- along with a motor and fan. The compressor, in the back of the unit, pumps liquid refrigerant into the evaporator coils. As the refrigerant enters the coils, it changes into a gas, absorbing heat in the process. At the same time, the evaporator fan blows air over the coils, circulating cool air into the refrigerator through a vent in the freezer wall, and keeping the temperature in both the fridge and freezer constant. Frigidaire refrigerators are self-defrosting. They have heaters tucked amid the coils of the evaporator unit. These heaters warm up periodically -- they are controlled by a timer -- to prevent any humidity in the freezer from freezing on the evaporator coils. This happens about every six to eight hours, according to the RepairClinic. If there is frost or ice on the coils, it melts and drips into a pan beneath your fridge, where another fan blows warm air on the water to speed evaporation. If you see ice and frost collecting on the walls or ceiling of your freezer, it's a sign that there is a large amount of ice built up on the evaporator coils. This could indicate a problem with the evaporator fan blades, the fan's motor, the evaporator unit or the self-defrost unit. Repair or replacement of the evaporator or self-defrost units must be done by a professional, but you can ease the problem by manually defrosting your Frigidaire side-by-side refrigerator. Remove all of the food from the appliance, unplug it and let it warm up for two days. The ice build-up melts. Plug it back in and see if it runs properly. APWagner: How Do Refrigerators Work?